This is a cool mouse for gamers. Wonderful LED lights with the exciting sound from your gaming, make you indulge in your gaming time. At the same time, the deign of the clicking soundless creats a quiet environment, therefore, people around you can also enjoy their relaxing or working time. Built-in rechargeable battery saves you from the problem of dealing with numberous used AA batteries and your money. 2. Only the left and right buttons of the mouse is silent, the two side buttons are not. 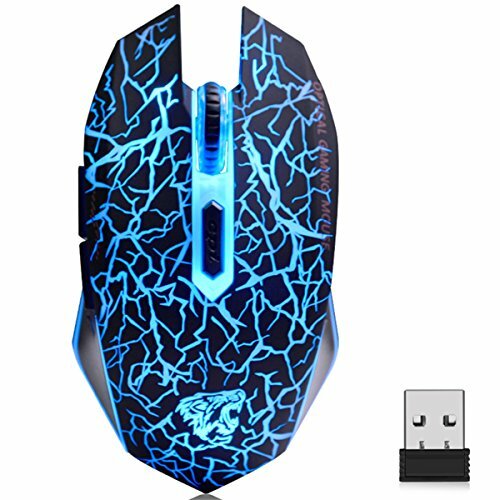 Amazing LED Lights: The wireless mouse changes colors randomly to 7 different color schemes, creating amazing feelings for gaming or working. The lights is soft so that it will be not distracting when you are using it. You can turn off the light if you do not need it. Stable and Precise Tracking: 2.4GHz wireless technology offers a stable connection between USB receiver and your computer. Sensitive optical sensor provides precise and freely movement. Soundless Clicking: Both left and right buttons are silent, saving you from the sharp clicking noises. You can enjoy your leisure or working time without bothering other people around you. Friendly Environment Battery: Built-in 600mAh Lithium rechargeable battery, it can be repeated charging. It comes with a USB port charging cable, and you can use the mouse even when it is recharging. Never afraid that the mouse will run out of power. Comfortable Feeling: Natural curve design, cozy materials and medium size keep your hand in very good condition. And the quick thumb-side buttons, achieving the function of page forward and page backward, allow you look through pages freely. If you have any questions about this product by VEGCOO, contact us by completing and submitting the form below. If you are looking for a specif part number, please include it with your message. Accessory Power ENHANCE Blue LED PC Gaming Headset GX-H1 with UPGRADED Virtual 7.1 Surround Sound & Adjustable Mic - Works With EVOLVE, League of Legends, DOTA 2 and many more!